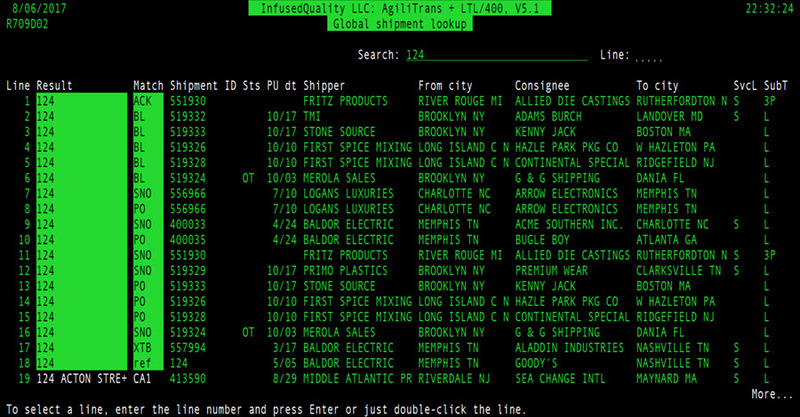 AgiliTrans and LTL/400 run on IBM's i (a.k.a. AS/400) platform and offer a fully-integrated quote-to-cash application supporting LTL, hybrid LTL/TL, and expedited LTL for asset-based operators and all modes of transportation (including LTL, TL, COFC, and TOFC) for 3PL/intermodal marketing company mode-neutral operators. LTL/400 and AgiliTrans Version 5.1 was announced in 2016 and became available on September 1, 2017. This major release includes ground-up rewrites of bill entry, service points management, pricing (including pricing upload by spreadsheet), rating, and EDI. We provide interim updates between releases. The next major release is expected to focus on technical updates and is currently in prototype. If so, you have multiple options. While green screens aren't popular with everybody, they are extremely efficient, very stable, and easy to use. In LTL/400 and AgiliTrans, our screens are carefully designed to provide consistent operation and high function all the way down to context-sensitive help. Want a web interface? We can do it. InfusedQuality LLC provides high-quality, cost-effective AS400/System i-platformed business solutions to transportation organizations of all sizes (from 50 to more than 100,000 bills/day). Our products--LTL/400 for LTL, LTL/TL, and expedited carriers (including freight forwarders) and AgiliTrans for mode-neutral/3PL transportation and logistics providers--will support and enhance your best business practices and ideas. You'll have a stable, reliable, and cost-effective operations and administrative system that will support your customers, business partners, employees, and shareholders through growth, personnel turnover, and changes in the business environment. Please contact InfusedQuality LLC to discuss your business concerns and issues. 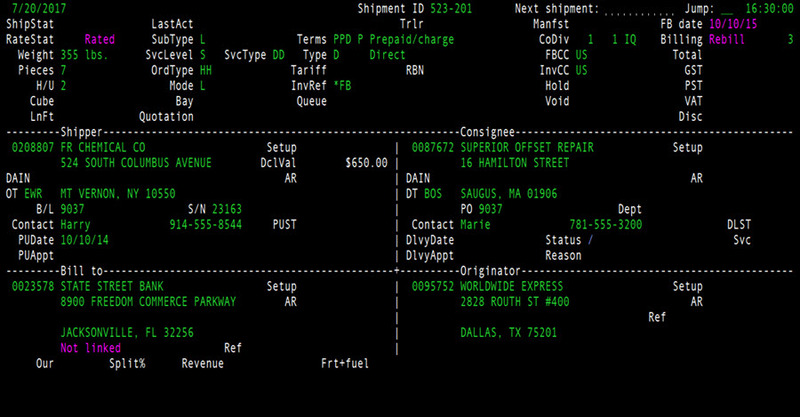 The shipment inquiry program allows users to drill down into any aspect of a shipment, including rating activity, dispatching, delivery information, OS&D, freight claims (but not approval or payment information), revenue accounting, accounts receivable, and transportation payables. The global shipment lookup function, available in most programs requiring a shipment ID (pro) number, enables easy access to shipments using names, addresses, or reference numbers when the shipment ID isn't known. LTL/400 is a quote-to-cash transportation management system (including a complete revenue accounting application set) designed specifically for asset-based LTL carriers and freight forwarders of any size (our customers' volumes range from 100 to more than 30,000 shipments/day). AgilTrans is a quote-to-cash transportation management system designed specifically for intermodal marketing (3PL) businesses and handles COFC, TOFC, air cargo, truckload, and LTL traffic. It runs 3PL-specific pricing, order entry, and operations management applications but shares LTL/400's revenue accounting applications. Our current projects include converting a mainframe system to LTL/400 and deploying a new instance of LTL/400 in a multi-company environment. Our services include customizing LTL/400 and AgiliTrans core applications; developing data migration and cleanup systems; and providing long-term operational support.